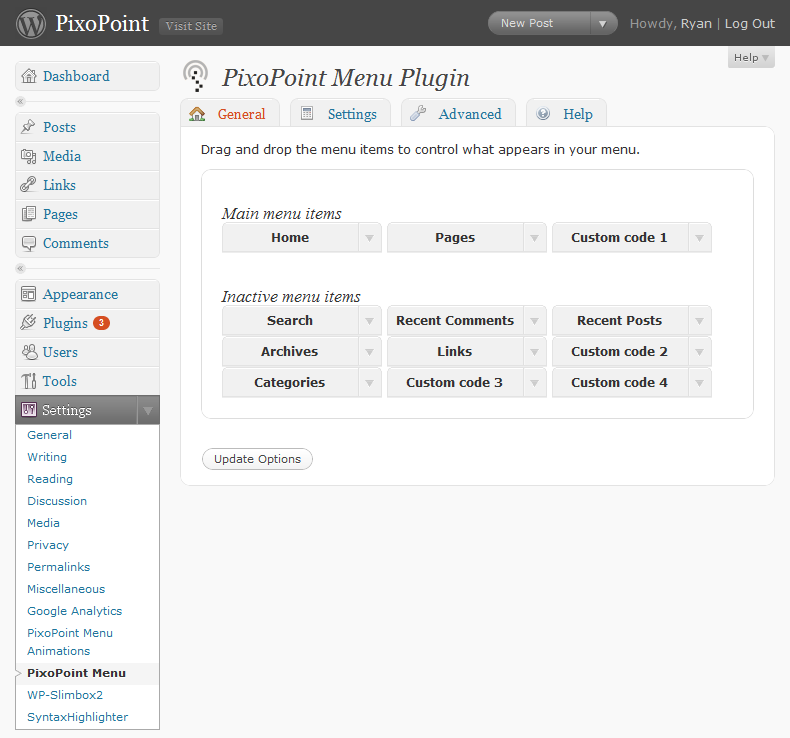 We are proud to announce the release of the PixoPoint Menu plugin 0.8.x beta. The most noticeable change when you install the plugin, is a slick new tab navigation system for the admin page. However the main changes to the plugin are under the hood. Note: As this is only a beta release, this version of the plugin is not recommended for use on production websites. Checks for correct path of wp-load.php. This allows the plugin to work even when the plugin folder is moved relative to the WordPress root folder. Changed ‘Help’ section to read in data from PixoPoint.com. This is useful as it ensures that the same information is available on both our site and inside the plugin itself. 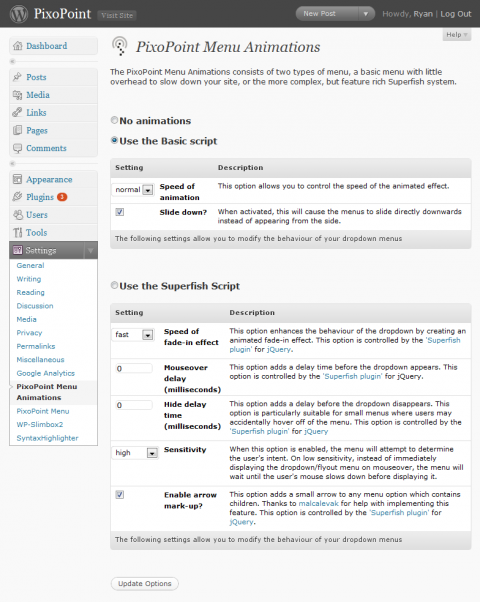 Depreciated Superfish functionality and loaded it via a separate plugin (currently provided in the core download). This plugin will eventually only be available as a separate download. 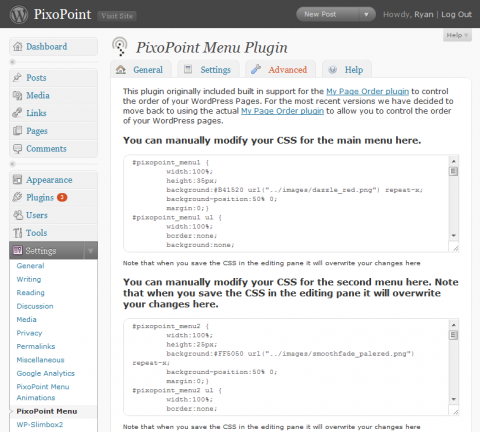 Many users don’t require the full functionality of the PixoPoint Menu plugin, so by extracting this functionality out into a separate plugin makes it more useful to a broader range of users. Another animation option called “Basic” was added to the separate animations plugin. Some minor bugs have been removed from the drag and drop facility, but it pretty much works the same as the original PixoPoint Menu plugin. Many of the users of the original PixoPoint Menu plugin found the number of settings too off-putting, so we have simplified things as much as possible for them. 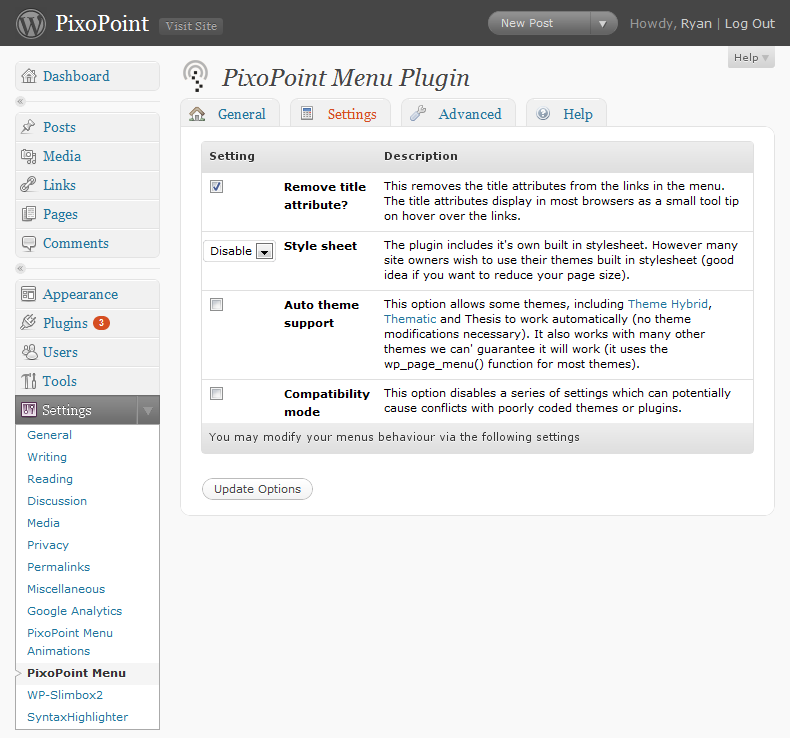 The settings page is now simplified in comparison to the original PixoPoint Menu plugin. The CSS editing area is now present in the advanced tab. You can upload/modify your CSS directly via the 'Advanced' tab. As always, this system works well with our dropdown menu CSS generator. On upgrading or installing a fresh new version of the PixoPoint Menu plugin, an extra plugin called “PixoPoint Animations” will be activated. This plugin includes all of the dropdown menu animation functionality originally included in the core plugin, along with an extra option called the “Basic” animations which creates a different animation effect with slightly less code than is required for the Superfish script. This plugin will be eventually extracted and released as an entire separate download. For the mean time, it is bundled with the original plugin to ensure that upgrades go smoothly. On upgrading, or installing a fresh installation of the plugin, a second plugin called 'PixoPoint Menu Animations' will be activated. This will eventually be available as a separate download. The PixoPoint Animations plugin is detected as being the PixoPoint Menu plugin and so immediately says it needs updated, except instead of updating, it gets deleted and is replaced by the original PixoPoint Menu plugin. A solution to this is being sorted on WP Tavern. 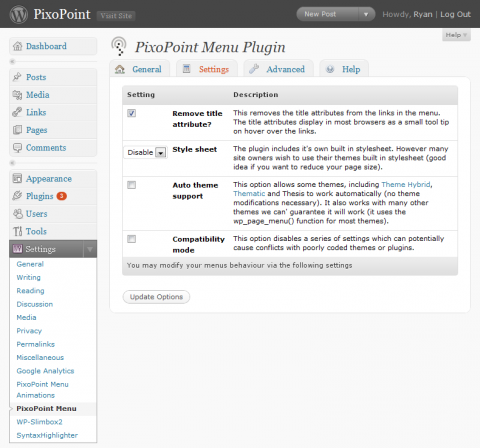 This plugin is intended as a replacement for both the PixoPoint Menu plugin and the Multi-level Navigation plugin. If installed while the Multi-level Navigation plugin is running, it will deactivate that plugin, then transfer all of your settings (including your CSS) over to the new plugin and then clean your database of all of the old Multi-level Navigation plugin data (that plugin added lots of pointless junk to your database). 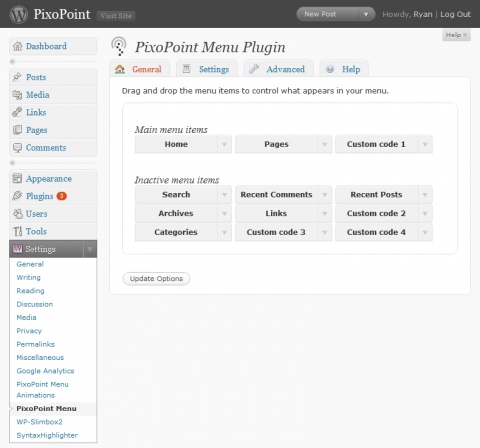 Future versions of the Multi-level Navigation plugin will automatically upgrade themselves to the new PixoPoint Menu plugin. This will not be happening until extensive testing has been undertaken to ensure there are no glitches during the upgrade process. As soon as I activate this plugin I get a blank screen, and I my whole website turns blank screen..
Hi, i don’t know why, but the menu is displayed in my left side bar in a horizontal way, and not in a vertical way, i just don´t know why, and i can not solve that problem, and as the menu is displayed in a horizontal way, I get the list of pages like a text down because of the left side width to 150px, and is very different to the page that you show. Have ever got some problem like that? New version (0.8.6 beta) has been uploaded. This version includes improved CSS caching and irons out a bug in the admin panel which was preventing the widgets page from appearing correctly (the plugins CSS was loading on ALL admin pages instead of just the one it was intended for). I installed your new menu version 0.8.12 beta (could not find 8.6) have 3 problems I would like to give you as feed back. 1 The “top level only” is not working for me. All levels show even if I put the settings on top level only. 2 I don’t think the animation is working for me. 3 I have a YouTube video embedded and the drop down menu is hiding behind it. I had the same problem with the old version as well though. I don’t know if these are bugs or not, but I figured you would like to know so if they are you can fix them before you leave the beta version. 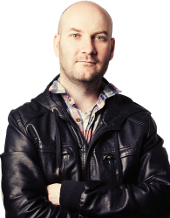 I can give you access to the admin area on my site if you decide it might help you. The first one “The “top level only” is not working for me” definitely sounds like a bug. I’m guessing the others are just problems with the implementation of it. The arrow function is not working. Could be an indication that the animation has not kicked in I guess. That’s probably related to a jQuery clash. Reactivated the plugin. That solved the problem. Just wanted you to know. I am sorry, but I think there is one more piece of information you might want to know. I checked the drop down menu hiding effect only in Safari before, and it does not work in Safari. It does not work in IE either, but it works in Firefox. I was not looking for support Ryan. I just wanted to give you feed back since you are in beta mode. I think I must have been in auto-pilot when replying yesterday. Most of the comments I receive here are simply because users haven’t made their way to the support forum yet and I have a pre-written responses for them already lined up. I upgraded to 8.14 and this is what I see on my end. The top level drop down does still not work. All levels show even if I set it on top level only. The basic level works in the animation, but not the advanced mode. There is no fade effect and all arrows are gone in advanced mode. The advanced level work for me with 8.12. Please let me know if you don’t want the feedback at this stage or in an other place. Take care and good luck with all your hard work. Thanks 🙂 Feedback is always welcome and appreciated. Do you have a URL showing these problems? It’s hard to tell exactly what is going on without knowing what is being generated in the source code. 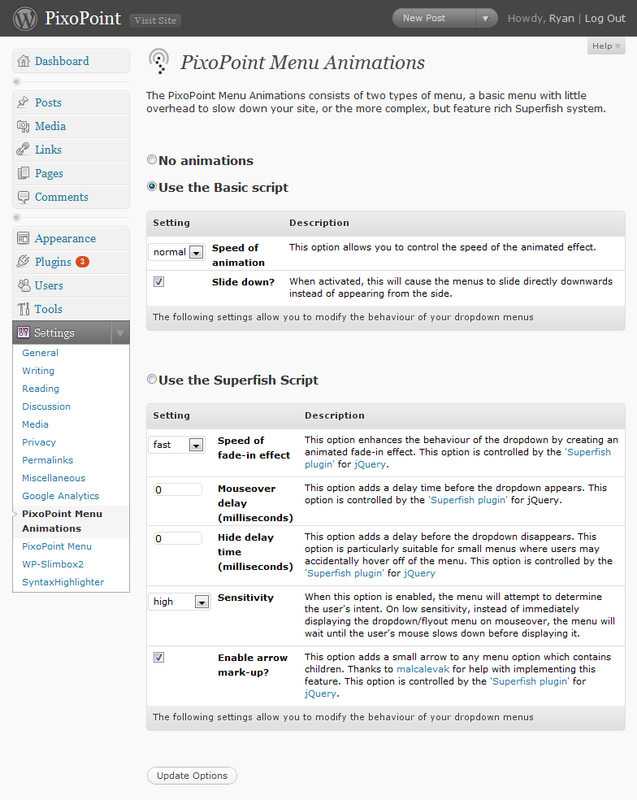 The animation problems may be related to a clash with a plugin or theme. The url is http://www.iskanorfalsterbo.se. I can give you access to the admin area if that will make it easier for you, but then I have to send you the log in information in an e-mail. I thought about your comment abut the animation. If that would be the case, don’t you think that would prevent all options from working? It is only the advanced option that does not work. Some more feedback. 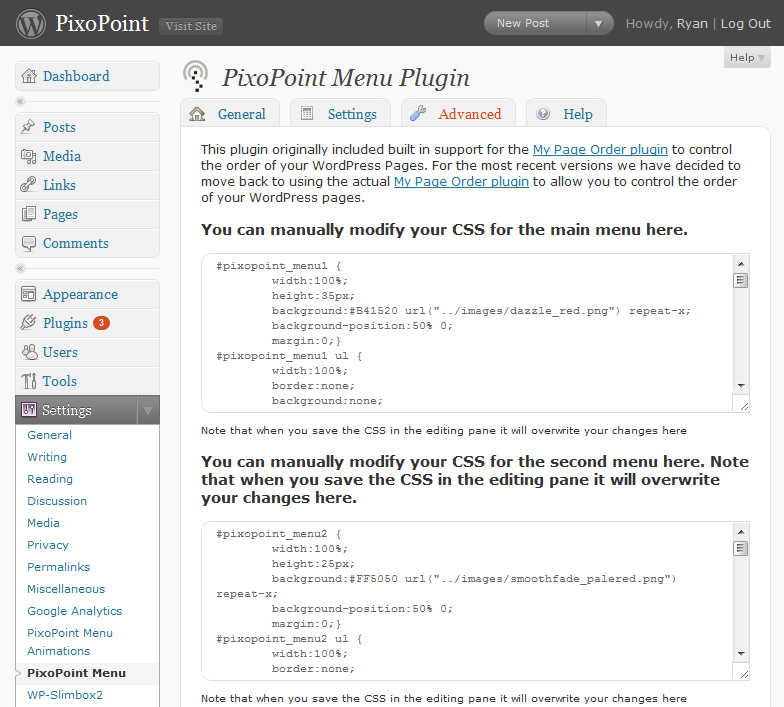 I had to disable the “PixoPoint Menu: Animations” because it interfered with the plugin “Frontpage-Slideshow”. I don’t know which one of the plugins that is not behaving as it should. My guess is that it is the Animation since i don’t have a problem when it is not activated. Are these problems specific to the beta plugin? I see you are using the old plugin at the moment and the animations are working. I’d love to see the problems you were experiencing in case it’s a problem with the plugin. The problem I had before I switched back to the old was the animation. I will switch back so you can take a look, but I can’t do it right now because I am not home and my ftp server is not working. If I could reach the 8.14 through the regular plugin download I would be ok. Will let you know as soon as I can switch back to the new. I have still not been able to switch back to the beta version. I have asked a friend to put the files on my server. I will let you know when it is all done. I just switched over to 8.14 and the new animation plugin. This is what I still find not working after a short glans. 2. Can’t drag and drop in the Pixopoint admin page. 3. The Pixopoint page shows as one long page only. 4. The drop down function in the general admin page for WordPress stops working. There might be more I can’t see at this point. If you want to be able to get into my admin area for the site let me know and also send me your email because I don’t want to give you the password on the open air. Great. I am switching back to the old version, let me know if you need me to go back to 8.14 or if there is anything else I can do to help. I think I’ve figures these problems out now. I had inadvertently copy and pasted code from the PixoPoint Menu plugin into the PixoPoint Animations plugin and messed up the other plugin in the process. I discovered it when I tried to change the plugins’ settings on my own site and everything broke spectacularly about 30 mins ago. My server is in Sweden and I am in the US right now. Is it possible to use rollover images in this menu? Rollover images are a CSS issue and this plugin (like all our other menu plugins) allows you to control your menu with CSS. I select the option to strip title= attributes, but they remain despite having selected the option. Thanks. This is a known issue but I appreciate your confirmation of them problem. It does not appear to be happening here on PixoPoint.com so I must have made a few changes to the version I’m running here at the moment. I’ll hopefully get time to update the beta with some more corrections over the coming weeks to correct these problems. I’ve been a happy user of Multi-level Navigation for awhile now. One thing I’m somewhat concerned about is the large amount of code it produces (since it produces the entire menu in all of its depth) for every page. I don’t know if this is even a valid concern, but…does PixoPoint Menu somehow obviate this? Should I be thinking of moving to PixoPoint? If you want to use all of the depth, then that’s how much code you need. However the PixoPoint Menu plugin (or at least this latest beta) does allow you to reduce the depth of some parts so that you aren’t unnecessarily loading HTML onto your page. Just curious how it is going. Are you making progress? I’m a long way behind schedule. I probably won’t get to this for quite a while now sorry. I’ve fixed the title tags problem now. New version should be uploaded in a few minutes. That sounds like something got corrupted during the installation. I can’t think of any reason it would totally crash a site like that. Well I tried the old beta. First all looked just the same, then an extra refresh and the standard css (lovely red) came up. Went to the admin to copy and paste my backed up original css and to my surprise it was still in there. Now the fun part why I tried it in the first place. I wanted to have my parent pages show the child 1-2 in dropdown, which did not work in 0.6. Well surprise also not in beta. So I just un installed it all and re-installed 0.6.24 I think it is. Now happy me, suddenly my pages dropdown works, so the re-install made my day today after many hours frustation why, why. Beta is maybe not ready, but I love 0.6. Hope the pages dropdown keeps working. I also put a message in the forum about the page dropdown, but you can ignore or delete that now, since it is solved. This beta will never be released unfortunately. It wasn’t very well received and became irrelevant with the introduction of menus into WordPress core. Hi Ryan. Thank you for a great plugin. I only have one question that I can´t figure out. How can i make the current menu button stay lit after pushed it and loaded the page? This plugin will never be released sorry. Try the multi-level navigation plugin instead or (even better) utilise the built in menu system in WordPress.